On Thursday, December 6, Brian Gross Fine Art opens an exhibition of recent paintings by Italian artist Marco Casentini, with an opening reception from 5:30 to 7:30 PM. 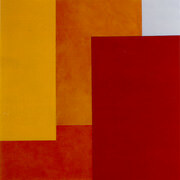 Casentini’s distinctly European paintings are refined geometric abstractions painted on aluminum panels. Their juxtaposing planes pulsate with vibrant color, creating distinct spatial tensions. On metal surfaces that range from one to two feet square or rectangular, Casentini uses acrylic paint to intuitively render four to five rectangular elements of varying scale and color. Mounted away from the wall, the paintings exist as a flux of geometries emphasized by the flatness of their medium and their sculptural presence. For Diary, his most recent body of work, Casentini draws from the rich hues of Italy. The paintings from this series allude to reductive vignettes of Mediteraneean landscapes or urban environments. Their interlocking planes form unique fusions in various tones of blue, vibrant green, tangerine orange, Venetian red, earthy beige and lavender offering potent visual combinations. Born in La Spezia, Italy in 1961, Casentini studied painting at the Liceo Artistico and the Accademia di Belle Arti, in Carrara, Italy. His work has been featured in solo and group exhibitions throughout the United States, Italy, Germany, Switzerland, Austria and the Netherlands as well as Australia. He currently lives and works in Milan. This is his second exhibition with Brian Gross.